By Virginia Prescott on Tuesday, April 28, 2009. Diamonds, guns, slaves and drugs may be the billion dollar black markets that we hear about, but animal trafficking is the third most lucrative criminal activity in the world. Illegal animal brokers and merchants are notoriously difficult to track down, but one Oregon crime lab has devoted itself entirely to the cause. The US Fish and Wildlife Service Forensics Laboratory is the first and only forensics lab in the world dedicated just to animals. It’s dealt with more than 10,000 cases from all over the world in the past twenty years. 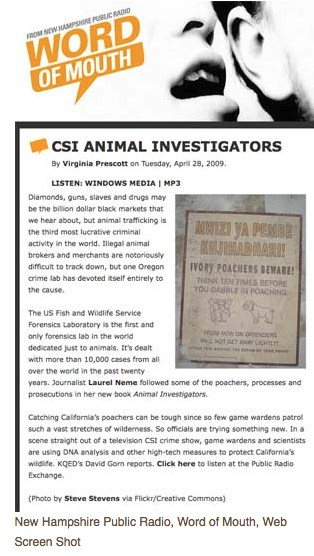 Journalist Laurel Neme followed some of the poachers, processes and prosecutions in her new book Animal Investigators. Catching California’s poachers can be tough since so few game wardens patrol such a vast stretches of wilderness. So officials are trying something new. In a scene straight out of a television CSI crime show, game wardens and scientists are using DNA analysis and other high-tech measures to protect California’s wildlife. KQED’s David Gorn reports. Click here to listen at the Public Radio Exchange.